Misbah Javed, Saeed Ur Rahman, Iqra Tanveer, Ghulam Asghar, Shazia Fatima, Mohammad Fahim. Aims: The study aimed at measuring the external radiation doses to workers from patients who were administered radiopharmaceuticals in the nuclear medicine department. 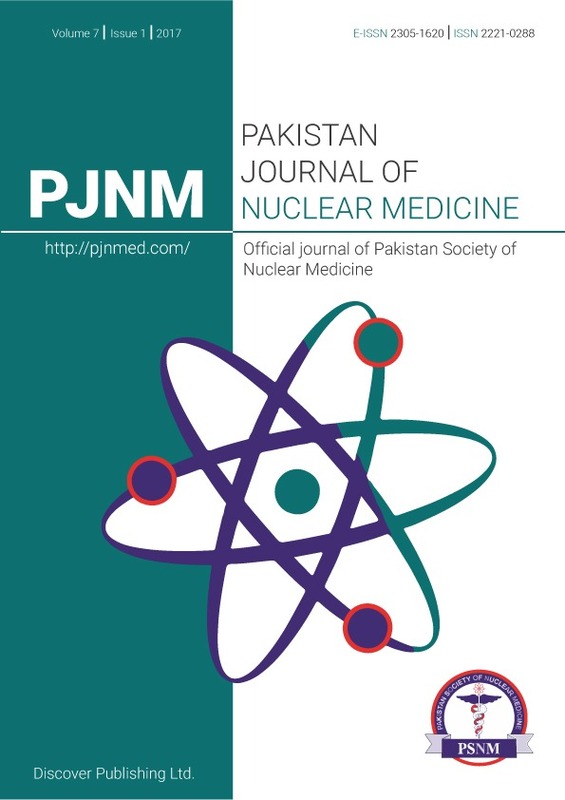 The purpose of this study was to evaluate the radiation safety procedures in the department of nuclear medicine. Methods: A total of 80 patients were randomly selected for the study. These patients were injected with either 99mTcpertechnetate or 99mTc-MDP (methylene diphosphonate). The dose rate was measured in hot lab, waiting room and in the scanning room at distances of 10, 50 and 100 cm from the patient at different time intervals by using a radiation survey meter. The absorbed dose from radioactive patient to radiation workers was calculated by using RADAR software and mathematical formulae from the measured dose rate. Results: The mean dose rate from thyroid scan atients at a distance of 10, 50 and 100 cm, after administration of injection was found to be 41 Î¼Sv/h, 31 Î¼Sv/h and 22 Î¼Sv/h respectively; whereas the dose rate from bone scan patients was calculated at 62 Î¼Sv/h, 31 Î¼Sv/h and 28 Î¼Sv/h. The dose rate was also measured after 15 min and 30 min in waiting and scanning room for the same patients. The mean absorbed dose to nuclear medicine occupational workers calculated both manually and using RADAR software came out to be less than 1mSv/year. Conclusion: The external doses to radiation workers were within permissible level. The results obtained in the present study are comparable to the previous studies conducted world wide. The radiation dose level to occupational workers in our nuclear medicine department does not exceed the recommended dose limits for workers.